In 1999, an expedition from the British Museum succeeds in uncovering the tomb and mummy of the Ancient Egyptian black sorcerer Talos. Once back in England, the mummy vanishes from the museum. Soon people all over London are being killed and their organs removed. One of the archaeologists, a crazed psychic, tries to convince the others and investigating police that Talos is going to be revived at the point of the planetary alignment in three days time. Around 1998-9, the mummy movie made a major comeback. Fairly much every monster had been revamped with CGI effects throughout the 90s and it was the turn of the mummy with the big-budget The Mummy (1999). On the outskirts of this revival was Michael Almereyda’s fascinating The Eternal/Trance (1998) and Talos the Mummy, which comes from Australian director Russell Mulcahy. (See below for Russell Mulcahy’s other films). Mulcahy clearly has a personal investiture in this film – he co-writes, provides the story and co-produces, something he has never done on any of his other films. Despite a budget that lies somewhere between B+ and A– and a reasonably lavish look, Talos the Mummy went straight to video in the US, where it was retitled and sold as Tale of the Mummy. The classic mummy film is the original Boris Karloff The Mummy (1932). Throughout the 1940s, the mummy movie was a genre that had been creatively mined by sequels to the Karloff film to the point that its shuffling monster was only a comic threat. Classic Universal films of the 1940s are notedly prosaic. The one thing that the 1990s mummy movie was able to do was to open the mummy movie up – The Mummy 99 offered a full flight of Indiana Jones high adventure with the mummy wielding the Biblical Plagues of Moses; while The Eternal offered a haunting vision of an unkillable doppelganger. Talos the Mummy/Tale of a Mummy leaps in with a remarkable arsenal of effects (the film is co-produced by the high profile KNB EFX Group makeup effects company) with images of bandages and paper dragging victims away, wild visions of a skeletal figure formed out of bandages scuttling along a ceiling, and Christopher Lee – who also played the title figure in Hammer’s The Mummy (1959) – calcifying to stone and shattering. 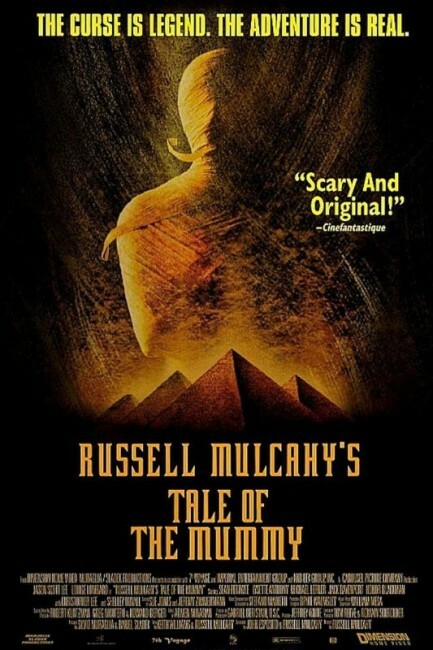 Unfortunately, in most other ways, Talos the Mummy/Tale of a Mummy is a completely routine mummy movie. Russell Mulcahy’s script throws in a good deal of claptrap nonsense about psychics and planetary alignments, along with the usual mummy movie cliches about the mummy’s reincarnated love. It even manages to throw in a brief touch of the millennial apocalypse, while there is a silly twist ending. Moreover, it is not a terribly convincing film. The setting is supposedly London (actually shot in Luxembourg), although it is not a very convincing London – the cops act like American cops, shooting guns everywhere. Jason Scott Lee seems badly miscast as an Asian-American cop who for no reasons that are ever explained just turns up on the British police force. There are good performances from Louise Lombard and Lysette Anthony, although Sean Pertwee gives one that is extremely silly and over the top. Russell Mulcahy’s other genre films include:- the killer boar film Razorback (1984), Highlander (1986) and Highlander II: The Quickening (1991), the revenge drama Ricochet (1991), the mystical radio superhero adaptation The Shadow (1994), the serial killer thriller Resurrection (1999), the tv mini-series remake of On the Beach (2000), the tv mini-series of Jules Verne’s Mysterious Island (2005), the tv mini-series The Curse of King Tut’s Tomb (2006), Resident Evil: Extinction (2007) and The Scorpion King: Rise of a Warrior (2008). Mulcahy also wrote/produced the killer shark film Bait (2012). (Winner for Best Makeup Effects at this site’s Best of 1998 Awards).